How's that for a catchy title? Mango Madness is the name of the VersaMagic Ink I used to stamp this card! This layout is from a challenge to us Paper Cuts members on Paper Wings, a site that us "angels" use to promote TAC products with a cool gallery and fun stuff. The stamps I used are from Unexpected Joys, a Hostess level A set and Watercolor Plants. I also used my Coluzzle Nested Circles (now discontinued by manufacturer - darn!) and a Cuttlebug embossing folder. 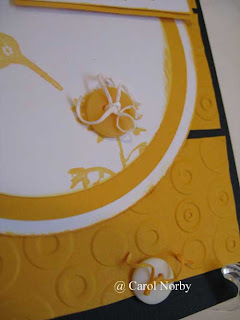 I also used black & white cardstocks, and this yellowish orange that I have in my stock. Here is a close up of the lower right corner. I colored my white scrappers floss with the Mango Madness to make it match. How cool is that! 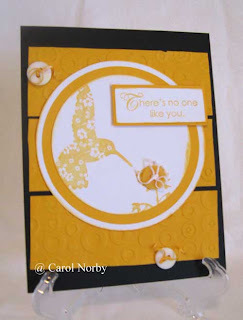 Awesome card Carol! Love the button & floss and especially that you colored the lower floss with the ink. How cool is that is right!